Note: A few of you have been clamoring for Europe pictures... I promise I am working on it. It's been a little crazy around here since we've been back. I was hoping to have the first batch ready for today's post, but that just didn't happen. So hang in there a little while longer, and next week there will be photo overload. This butterscotch custard could stop an army, it's so good. Delicately sweet, thick and smooth, an unexpected love. In a saucepan, combine the milk and cream over medium heat. Once it simmers, turn off the heat and set aside. In a separate saucepan, melt the butter over medium-high heat. Stir in the brown sugar, and cook about 5 minutes, stirring constantly, to caramelize the mixture (it will be thick).Whisking constantly, gradually add the brown sugar mixture to the hot cream mixture. Put the egg yolks in a bowl, whisk lightly. Combine cornstarch and salt in a medium bowl, gradually whisk in about 1 cup of the hot milk mixture, blending until smooth. Gradually whisk in the egg yolks, whisking the mixture constantly. Add the egg mixture back to the hot cream, whisking constantly, and cook over medium-high heat until thick and just boiling. When the mixture thickens, there will be a few large bubbles boiling up to the top. Remove from heat and whisk in the vanilla extract. Pour custard through a sieve into a large bowl (to catch any small lumps). Pour into 6 cups, ramekins, or mugs and chill, uncovered, at least 2 hours or overnight. Serve chilled, garnish with whipped cream. I chose to serve it in tea cups, since the color reminded me of milky tea. 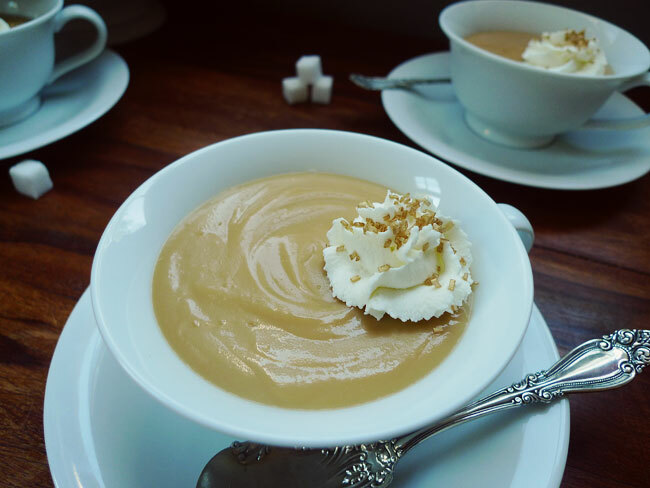 Since there is no dye in the recipe it won't be the bright orangey-brown we're used to associating with butterscotch. 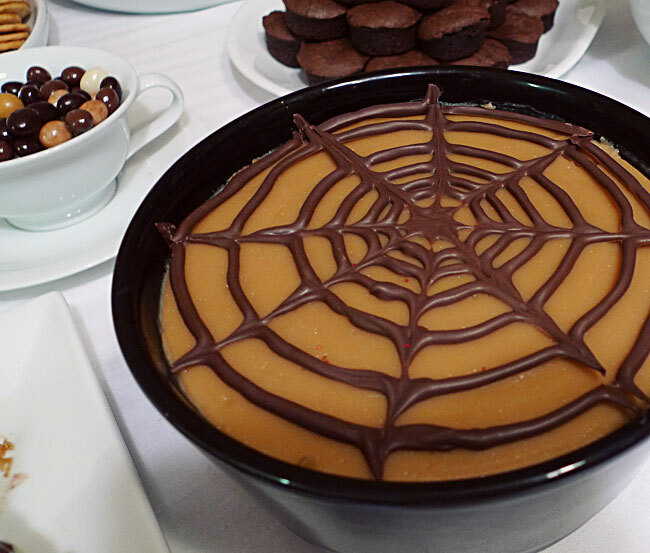 This custard was a hit at the Halloween party, and since I didn't want to deal with dozens of little ramekins, I served it in a large bowl, garnished with a chocolate spiderweb. To make the spiderweb, I traced the rim of the bowl onto a piece of paper. Using a variety of bowls, cups, and a spice jar, I made a series of declining circles inside the rim outline. I taped the paper down, laid a sheet of wax paper on top, and taped that down. Using melted chocolate in a squeeze bottle, I traced over the circles in chocolate, then immediately dragged a toothpick from the center to the edges to create the lines. I let it harden, then gently peeled off the wax paper and popped the web on top of the custard. I made a spider too, but I preferred the simpler look of just the web. To make the custard a little more pumpkin colored, I added a few drops of food coloring to the custard with the vanilla: 2 drops green, 4 drops red, 2 drops yellow. Oooooo... yummy! This custard sounds like a must try, and love the spiderweb!